We all know the story of Ben Franklin flying his humble kite in that fateful thunderstorm. It may be myth or it may be history, but there’s one thing I’m sure of – in his wildest dreams, old Ben could have never imagined the brilliant dancing lights that will be sparkling for the holidays in Franklin Square this year. How do I know? Well, I asked the historic icon himself. Yes, Ben Franklin was roaming around his favorite section of Philadelphia last week, enjoying the festivities that marked the opening of the Electrical Spectacle, the city’s outdoor holiday light show. As the crowd gathered, Franklin led them in a triple cheer of “Huzzah! Huzzah! Huzzah!” before flipping the switch to ignite the more than 50,000 festive lights in the Square. The lights sparkled, glittered and, yes, danced as “Joy to the World” blared from speakers and the good-humored crowd sang along. Ben even waved his walking stick in time. The light show is a relatively new addition to Franklin Square – and to the long-standing traditions of the holiday season in Philly. It premiered just last year, and during the 2013 season more than 90,000 people visited the Square to see the spectacular display and soak in holiday music as performed on the soundtrack by the Philly Pops. Franklin Square is a fun place for families all year round, with its Once Upon A Time story benches, its unique mini golf course with holes marked by mini Philly landmarks, and its old-fashioned carousel where kids can ride on such hometown notables as racehorses Afleet Alex and Smarty Jones and, of course, a Philadelphia eagle. Even though my family enjoys the Square in every season, I have to agree with Ben – there’s something special about Christmastime there. I’m not sure if it’s the music, the dancing lights, or the holiday decorations. Maybe it’s being outdoors in the crisp mid-Atlantic air while listening to familiar carols and greeting others as you walk on sidewalks lit up by snowflakes. 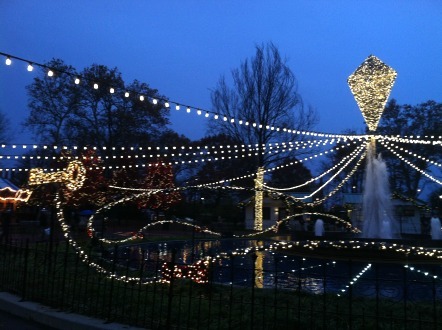 Whatever it is, I know that a trip to Franklin Square is one of our favorite ways to catch the holiday spirit. 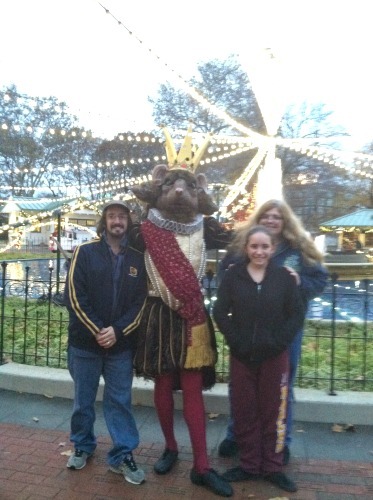 The holiday happenings opened with Ben’s “Huzzah!” on November 13, and will continue through December 31. Two alternating light shows will be presented every 30 minutes from 4:30 to 8 pm daily. Those hoping to meet the Big Guy in red are invited to Santa Saturdays every week from November 29 through December 20. Santa himself will be checking out the light display, collecting Christmas lists and taking photos with visitors (both naughty and nice, much to my kids’ relief). From 4-5pm each Saturday, there will be a special “Milk and Cookies with Santa” meet and greet in the Square’s heated pavilion, where Santa will be sharing holiday stories. Tickets are $10 and can be purchased through the Franklin Square web site. For the grown-ups, the new Barren Hill Brewery Winter Beer Garden will be serving up favorite beverages, including a variety of local seasonal beers presented by Old Eagle Tavern. 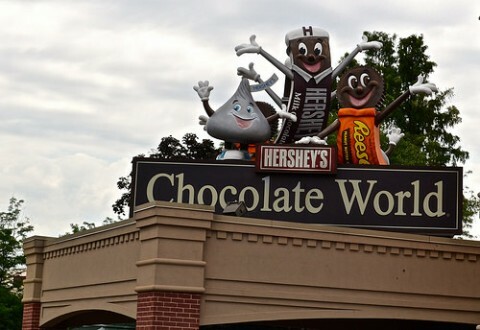 They also make a great hot chocolate, and serve up comfort foods as well. Try drinking your cocoa or favorite brew by the new outdoor fire pits for a real “taste” of the season. Opened Thursdays through Sundays, as well as December 26 through December 31. Those planning to “shop local” this holiday season need look no further than Franklin Square, where local artists and crafters will be setting up shop from 4-8 pm November 28-December 23. The Franklin Square Holiday Market is being presented in partnership with PHAIR, Philly’s weekly open air market, and will be the best place to purchase homemade crafts, one-of-a-kind art pieces, and that elusive just right present for the toughest people on your gift list. A full list of events – which include Food Truck Fridays, a kids’ New Year’s Eve event and an Ugly Sweater contest – can be found on the special Franklin Square holiday page. For more on area light shows, check out the Northeast section of the TMOM Holiday Lights round-up.